This kind of targeted conservation work is happening all across the country to preserve trails and cultural and historic sites, to build green spaces, playgrounds and ballfields in cities, and to set aside open spaces that provide clean air and water. The program touches every state in the nation. If you missed our poster in the 2019 PCTA calendar, have a look. 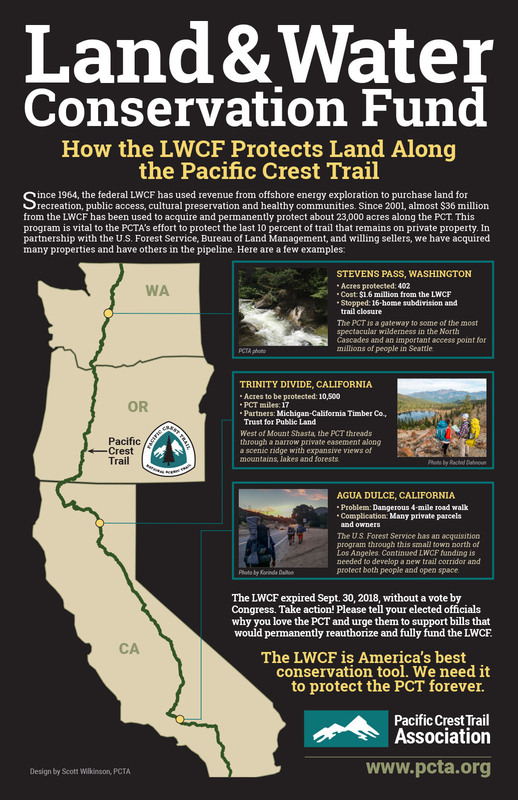 It explains why the LWCF is so important to completing the Pacific Crest Trail. The 115th Congress is coming to a close. By the end of the year, members of Congress will go home and that will be it. If LWCF bills are not voted on, they die, and the process will have to be started over after the new Congress comes together in 2019. We’re too close to let that happen. Tell your elected members of Congress that the time is now. No more waiting. No more hesitation. The money that once flowed into the LWCF from offshore oil leases — $75 million a month — has stopped. Yet the list of conservation projects on trails, in national parks and forests, and in communities across America is long. Contact your senators and congressional representative and tell them you support reauthorization and full funding of the Land and Water Conservation Fund. Tell them how much you love the PCT and educate them on how important this program is to the future of the trail and the public lands that you love. You can also write and submit a letter to the editor to your local newspaper voicing your support for the LWCF and urging Congress to act. Get on social media and share this post with your friends and hiking partners. Urge them to take action as well. Your voice matters, and our collective voices are being heard. Let’s do this.